The western coast of Maharashtra is bracing for heavy rainfall over the weekend. The IMD has issued warnings for the coastal stretch extending from Karnataka to northern Maharashtra. Over the past week, Kerala and some parts of the southern peninsula, including Bengaluru, have received strong showers indicating the arrival of monsoon. According to the latest weather status and outlook released by the met department on Thursday evening, several parts of southern and northeastern India have already received monsoonal showers and conditions over the coming week are suitable for further advance of the monsoon to the central and eastern parts of the country. The announcement of the arrival of the monsoon in Kerala around 10 days ago came as a relief for a country that has become habituated to fretting about the monsoon’s performance and the IMD’s ability or the lack of it to stay on top of it. The glut of articles and news reports on the “first showers of the monsoons” hitting several parts of peninsular India up to parts of Telangana and Rayalseema have missed crucial signs of an atypical start to the season. For one, the onset of monsoon in Kerala has been quieter than usual. Despite the normal date of onset, as announced by the IMD, Kerala has received rains that are deficient by 29 per cent compared to the long-term average of 110 mm during the first week of June. Off the southwestern coast, the atolls of Lakshadweep have received rains that are 35 per cent below the long-term mark. The reason for below-average rains in the regions that usher the monsoon into mainland is quite simple. The weather system that brought rains to Kerala in the end of May and convinced the IMD to issue the onset announcement subsequently moved away from the Indian mainland and brought rains in the central parts of the Arabian Sea. This is unusual for monsoon circulations that move inlands and not towards the oceans, and has cast doubts on the announced onset date. Further, rainfall in Telangana and Andhra Pradesh were brought on by a north-south trough running from central Madhya Pradesh to Telangana where moisture-laden winds from the Bay of Bengal converged to bring heavy rain and thundershowers. These rains are typical of pre-monsoon showers, rather than monsoonal rains. The fresh pulse that is expected to bring showers to the western coast is actually the first spell of concentrated rains, clearly seen to be associated with the monsoonal winds. 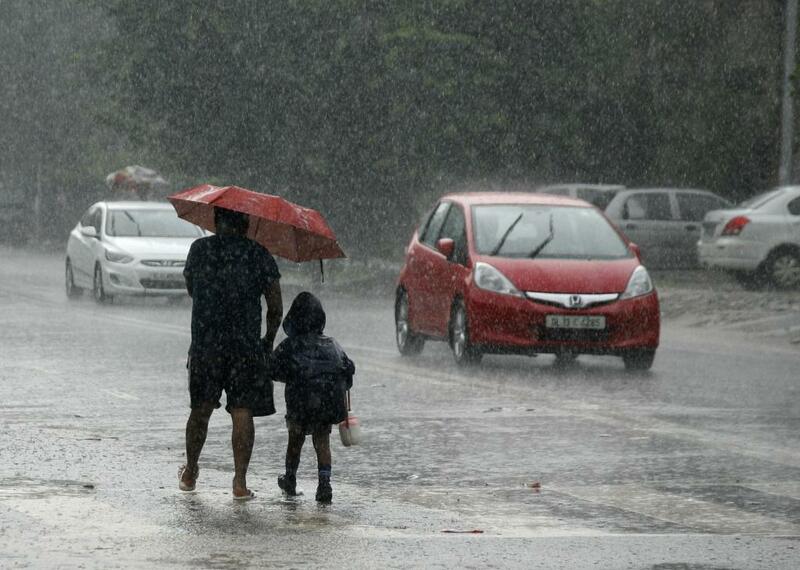 More than 90 per cent of IMD’s forecast for the next two days is about the strong advancement of monsoon. In the coming week, the IMD has predicted the same. Buried deep in IMD’s mostly rosy portrayal of the advancement of the monsoon are the lines, “During week 2 (June 14-20, 2018), there may be significant reduction in rainfall over most parts of the country outside northeast & adjoining east India, where it is likely to be above normal". IMD’s own prediction models though seem to indicate the same with much more certainty. According to the IMD’s numerical weather prediction model for rainfall, a long break in the advancement of monsoon is likely to be experienced immediately after the few days of heavy rains in coastal Maharashtra and the Konkan belt. According to the model prediction, which has been run on conditions as of June 8, rains will be concentrated in the southwestern coast running from Kerala to Maharashtra, but will fail to move further inland while the eastern branch of the monsoon circulation is likely to make inroads in northeast India. While the coast is set to receive consistent rainfall over the next 10 days or so, central India, which is slated to experience its first monsoon rain this weekend, is likely to face a long period of dry conditions following the brief spell, indicating fledgling progress of the monsoon. According to the extended range forecast, dry conditions are likely to dominate over the Indian subcontinent barring the Northeast and southwestern coast until the last week of June when a fresh pulse might push the monsoon further inland. The reason for the likely stalling of the monsoon is an anti-cyclonic circulation that is developing in the northern Arabian Sea, according to independent forecaster Akshay Deoras. “There is a large-scale strong anti-cyclonic system developing at over 30,000 ft in the northern Arabian Sea, off northwest India, which is pumping dry air into India through northwestern parts. From June 10-11 onwards, this system will be responsible for preventing monsoon winds from progressing into mainland and central India for up to two weeks. The reasons for the anti-cyclone aren’t certain yet but this is definitely an unusual development for this region at this time of the year and such an influx of dry air will effectively kill the monsoon circulation and bring a prolonged dry spell in the country until the last week of the month, as is even seen in the IMD’s models,” he says. While monsoon struggles to push inland, convective storms have been continuing at an unprecedented rate across northern India. The reason for the storms is the series of western disturbances (WDs) that have been observed to be active over the Indian region since the beginning of April. The seasonality of WDs, which normally peak in the winter months after which they migrate northwards, have been changing in recent years and are causing increasing unseasonal and unexpected weather impacts in the country. Last year, WDs caused the stalling of the monsoon in Maharashtra for over two weeks following the announcement of the arrival of the monsoon in the region by the IMD. After that, rainfall distribution did not recover with highly concentrated spells of extreme rains competing with prolonged dry spells over the entire season. By the end of the season, less than one-fifth of the total weekly observations were in the normal range despite the fact that the seasonal rainfall figures fell in the normal range. While IMD has stopped mentioning WDs following the increased scrutiny on the systems and their impacts on the pre-monsoon season, the system is still very much active in the Indian region. This year, over 14 active WDs have been observed since the beginning of April instead of the normal 2-3, and these are not showing any signs of stopping. Even the latest wind flow maps, from the beginning of June, are showing meandering but strong WD winds entering the Indian subcontinent in the northwestern and northern regions, bringing rains in the western Himalayan region and parts of the Indo-Gangetic plains. It is likely that these WD systems could once again be playing spoilsport in the progress of the monsoon.